Disarm, Don't Destroy the Middle East! The common cry of "destroy ISIS" is usually a demand for more of what led to ISIS in the first place: war. ISIS grew out of the U.S. war on Iraq, and is armed largely with U.S. weapons delivered to Iraq, Libya, and opposition groups in Syria. Between 2008 and 2011, 78.9% of weapons sales agreements to the Middle East were from the United States. And we know (because of a successful RootsAction.org petition) that between 2011 and 2014 that figure dropped only slightly to 58.6% -- still a majority of the sales. 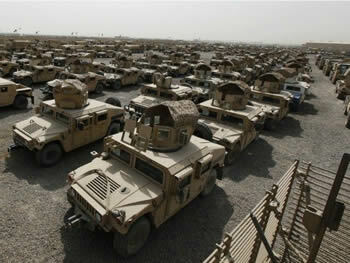 End U.S. arms shipments to the Middle East. Arms only intensify the violence. 10810 2.6 years ago Stephen Brackens Brinkley San Diego, CA , US This is so very important. Sisters and Brothers, please support this. 10795 2.8 years ago Mary Ann Andruscavage North Miami Beach, FL , US Stop war in Middle East.